There are no beaches in the city itself, so you will need to take a bus ride or drive to sunbathe or swim. Varadero, a couple of hours to the east, has the best of the region's beaches and related attractions, and is a fun, pumping holiday resort ideal for an excursion. The Ernest Hemingway Museum - the writer's former home - is also close by, in the suburb of San Francisco de Paula, and well worth a look. For intriguing countryside, Pinar del Rio is farther afield to the south-west of Havana, and boasts good a hiking and caving terrain. In addition, another of Havana's nearby tourist attractions is the huge Parque Nacional Cienaga de Zapata, which is just perfect for lovers of the outdoors. Other popular day trip destinations include Guanabacoa, Playa, Santiago de Las Vegas and Regla. Lying approximately 130 km / 81 miles to the east of Havana and sited on the northern shoreline of Cuba is the fantastic beach resort of Varadero. This exclusive sliver of Cuba is loaded with fine beaches and hotels, and is perfect for sunbathers and swimmers. Side attractions include the oasis that is the Parque Josone, pre-Columbian cave drawings at the Cueva de Ambrosio, the much-visited Delfinario (Dolphin Centre), the magnificent Mansion Xanadu, and the Tropicana Matanzas, where evening cabaret entertainment is available. The inland city of Pinar del Rio is to be found roughly 150 km / 93 miles to the south-west of Havana, where it is something of a gateway to the beautiful province of the same name. The city itself holds some interest, with museums, brandy and tobacco factories, and a historic theatre (the Teatro Jose Jacinto Milanes), but the countryside is simply stunning, with limestone hills, deep caves and several prominent waterfalls. 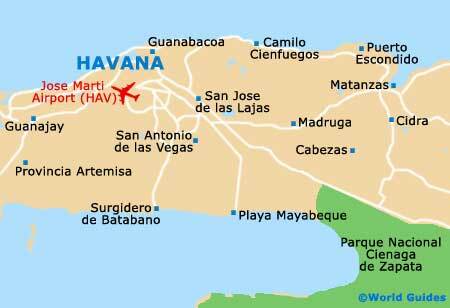 You can also see where Cuba grows its tobacco at the many plantations in the region. The Parque Nacional Cienaga de Zapata lies around 135 km / 84 miles to the south-east of Havana and is the largest national park on the island. It resides within the Matanzas province and has the look of Florida's Everglades, being especially noted for its bird watching and scuba diving. There are also some nice beaches and coastal attractions here, fronting the Gulf of Batabano, while the crocodile farm (Criadero Cocodrilo) serves as a notable magnet for tourists. Directly west of Havana, the municipality of Playa lies just across the Almendares River and comes with a number of enticing attractions, including an excellent aquarium (the Acuario Nacional), countless top restaurants and some striking fortresses fronting the bay. The neighbourhood of Mariano is where you will find the interesting Fundacion Naturaleza y El Hombre (Foundation of Nature and Man). Many important events take place at the Palacio de las Convenciones, which is also often referred to as the Havana Convention Centre. Keen scuba divers may like to organise a diving excursion at the La Aguja Marlin Diving Centre. Santiago de Las Vegas offers a very different side to Cuba, being far from commercial and certainly not geared up for tourism. However, this small city really comes alive each December, when thousands descend to join the pilgrimage to the Santuario de San Lazaro. The hilltop mausoleum of General Antonio Maceo (1845 to 1896) is also in the area and honours this hero of Cuba's independence. A historic destination close to Havana, Regla is situated just across from the Habana Vieja's harbourfront and is a busy port town, known for its strong Afro-Cuban community. The early 19th-century Iglesia de Nuestra Senora de Regla is one of the most notable attractions in Regla and is to be found close to the boat dock. Other highlights include the Municipal Museum (Museo Municipal de Regla), the Parque Guaicanamar and a monument to Vladimir Ilyich Lenin (1870 to 1924). A charming suburb of Havana, Guanabacoa is a neighbouring colonial township and is known for its rich Tainos Indian heritage. It is said that the famous Cuban national hero Jose Marti once gave his very first public speech here. Tourists taking a day trip to Guanabacoa may like to check out the imposing 18th-century Iglesia de Guanabacoa, or pay a visit to either the Municipal Museum (Museo Municipal de Guanabacoa) or the Martyrs Museum (Museo de Martires), where the famous Cuban revolution is remembered. Located approximately 20 minutes to the south-east of Havana, San Francisco de Paula was once called home by acclaimed American writer Ernest Hemingway (for more than 20 years), until in 1960, he chose to return to the USA. The villa where Hemingway lived has been converted into the Ernest Hemingway Museum and remains quite unchanged, containing his huge library, as well as some of his works and trophies. There are also art works by the likes of Picasso and Klee, along with Hemingway's very own fishing boat. At around 20 km / 12 miles to the south-east of Havana city centre, the historic colonial town of Santa Maria del Rosario is easy to reach and is therefore highly suitable for a day trip. Established in the early part of the 18th century, Santa Maria del Rosario has managed to retain much of its individual character. One of the town's oldest and most impressive buildings is the Catedral de los Campos de Cuba, which you may also hear referred to as the Iglesia de Nuestra Senora del Rosario. The suburb of Casablanca, not to be confused with the city of the same name in Morocco, is sited on the eastern side of the harbourfront entrance. Those taking an excursion to Casablanca will immediately notice the large marble statue of Christ, which enjoys an elevated situation overlooking the town. The Casablanca railway station connects many further attractions and Cuban destinations, such as Canasi, Guanabo and Matanzas.